The Smartcollar Veterinary Cone Dog Collars is a safe and humane method of preventing animals from aggravating a healing wound or injury. Safe, lightweight and translucent, the Smartcollar also has a padded neckline so there is no need to attach it to the dog's usual collar. The leather padding also covers the outer edge of the collar which not only protects furnishings around the home, but people's legs too! 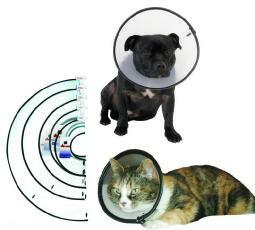 The only Elizabethan collar available with this feature. Simple to fit and easily adjustable.